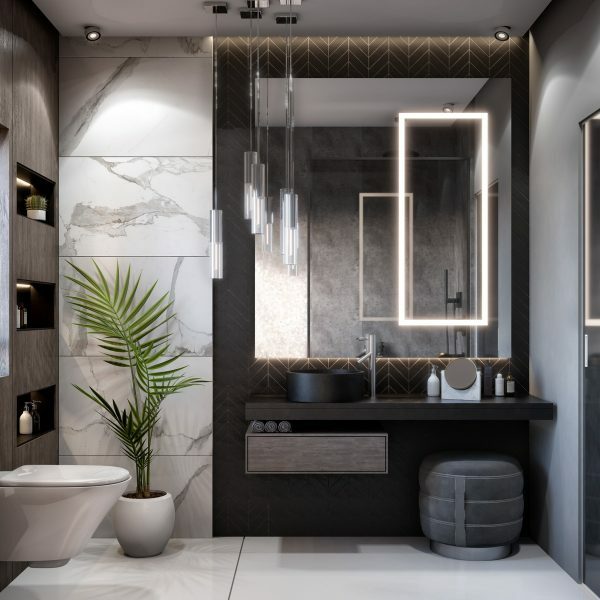 We see some pretty fabulous master bathroom designs on our endeavour to bring great new home designs to the masses, and feel it’s time to put them first (rather than at the end of pretty much every tour – that living room always has top billing no matter how showstopping the loo looks). 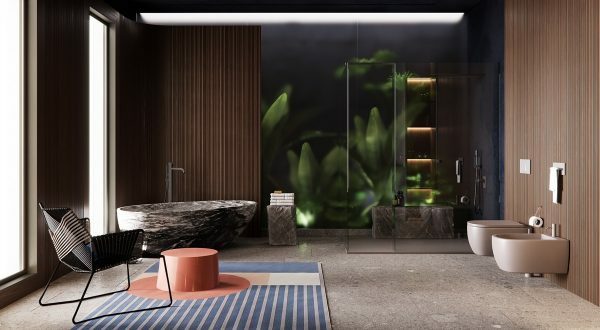 So, we’ve corralled an extensive gallery of 51 master bathroom designs that feature creative layouts, stunning bathroom furniture designs, and some gorgeous bathroom accessories to throw in that final finesse. 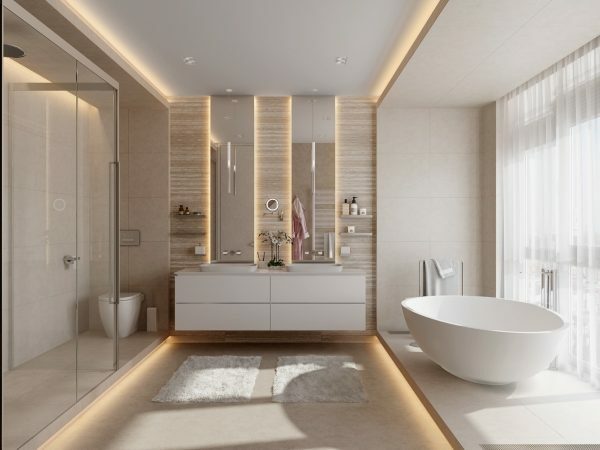 We’ve also added some hints and tips that will help you get on your way to creating your own magnificent master bathroom space. 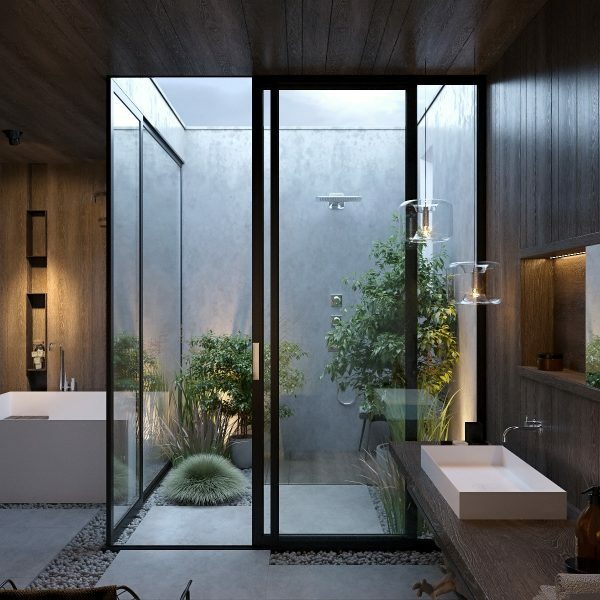 … Though focussed artificial lighting provides a dramatic effect too. 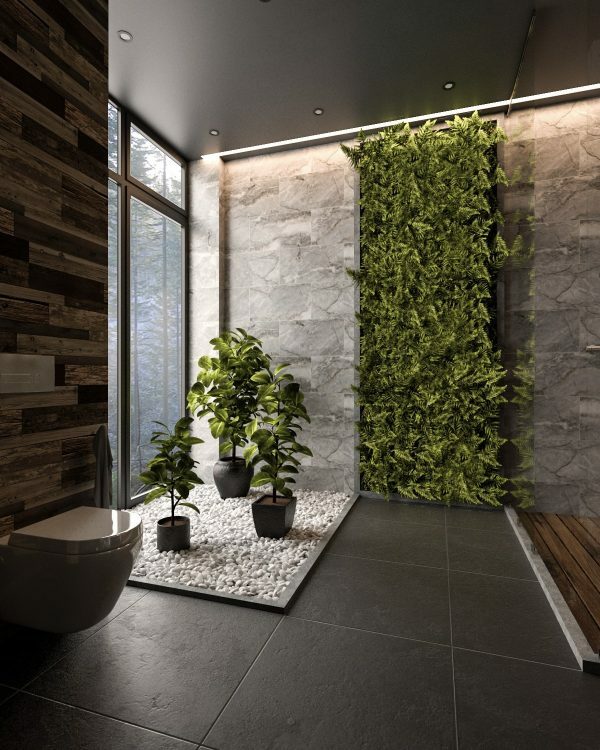 A vertical garden can be fashioned anywhere in the room. They are especially useful for disguising an irregular shaped structure or support columns. 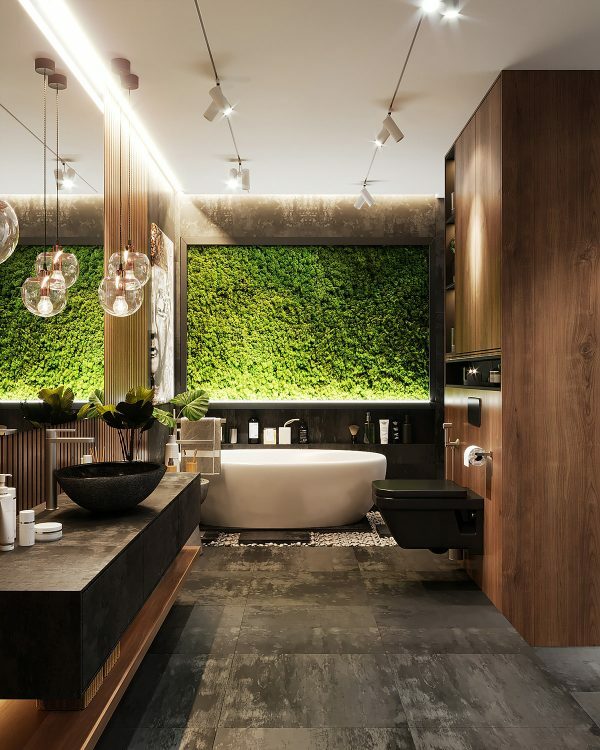 Put a bed of pebbles beneath the bathtub to connect the decor with a garden backdrop – whether it be a living wall, a bathroom courtyard, or a gorgeous view. You can use pebbles to easily and cheaply define a makeshift bathroom courtyard; simply plant a few pots in it. 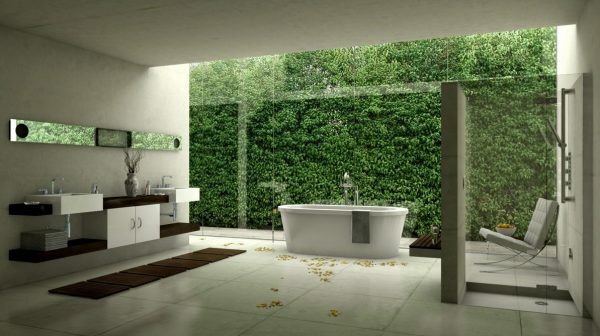 Putting the plants by the window is a good idea, so that they get plenty of natural sunlight to grow. 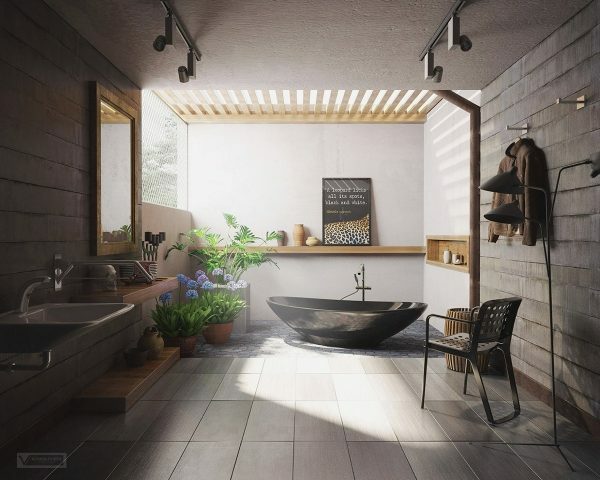 Add a slice of interest with contrasting floor treatments and wall tiles. 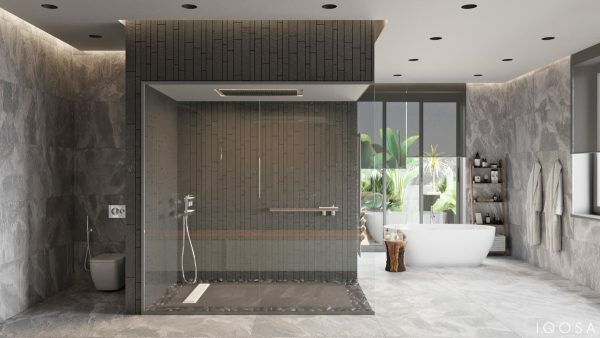 It’s not unusual to pick out more than one style of tile for your bathroom to define a shower floor or a raised platform, but why not push it beyond parallel lines? Cut tiles or boards on the diagonal to make a stand out space. 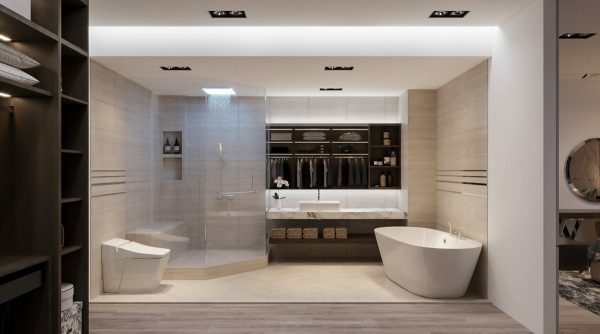 Open up a master bathroom to be part of the bedroom. 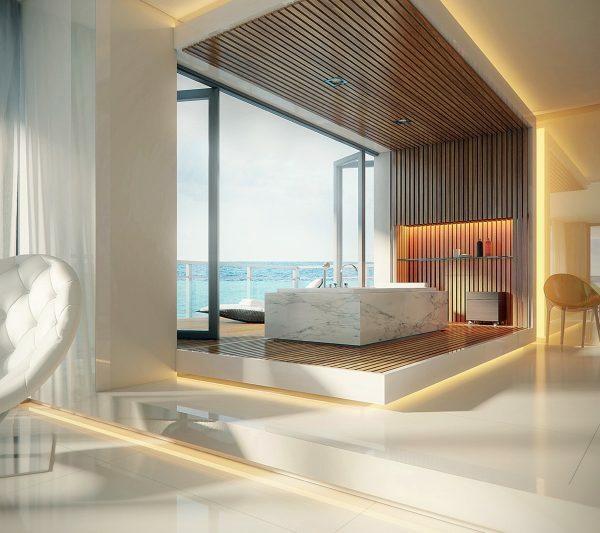 The combined square footage will make a more impressive sized suite. 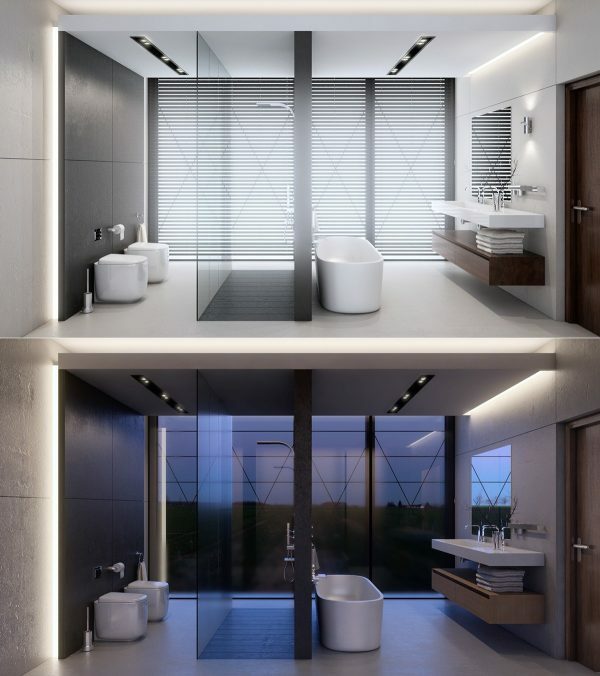 Privacy curtains can be drawn across whenever required. Highlight those edges. LED strips have many, many applications, but none so popular right now as the perimeter lighting track. 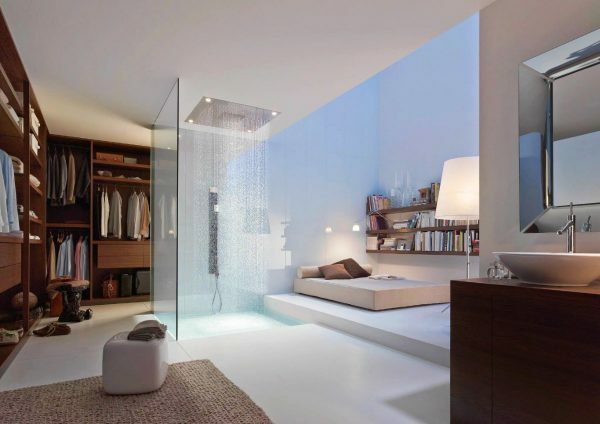 Light up every edge of raised floor, dropped ceiling, shower wall and vanity mirror. LED perimeter lighting can make huge volumes appear weightless, as if floating just ever so slightly above the ground. Add a little shimmer to your wet wall. The extra sheen will bestow a look of glamour on the whole room. 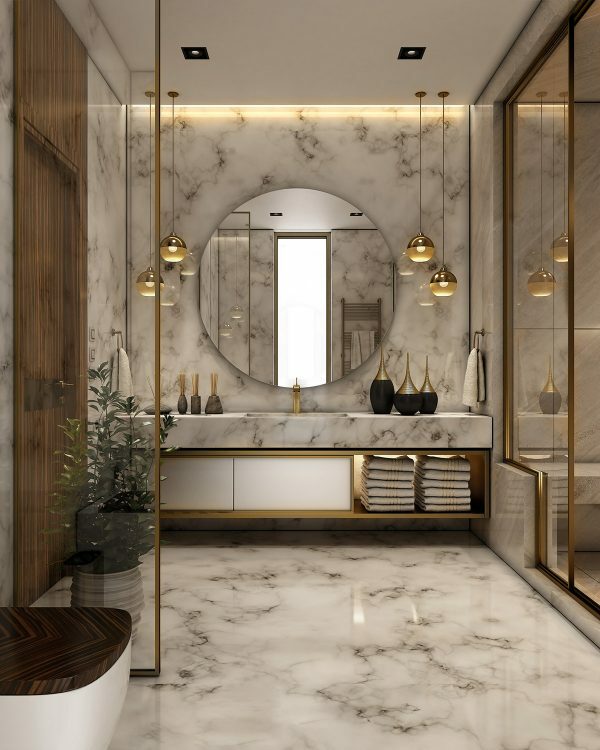 Team with some marble accents to take the trend high-end. Screen the scene. Decorative screens allow tantalising glimpses of scenic views to filter through, whilst still maintaining a level of privacy. 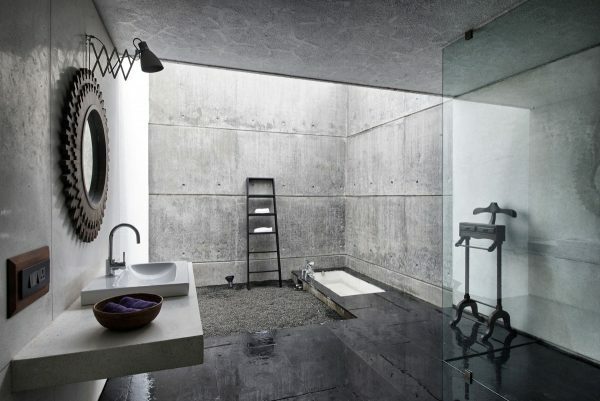 Match dark metal screens with concrete bathroom decor for a strong aesthetic. Layered rugs aren’t only for living rooms. 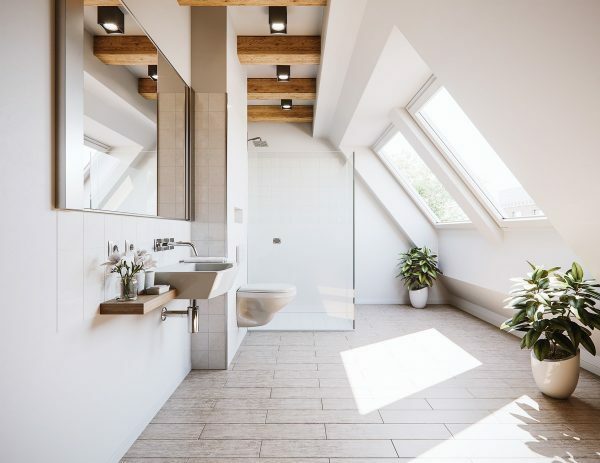 The bathroom can sometimes feel like a sterile place, with hard wooden flooring or cold tile underfoot. 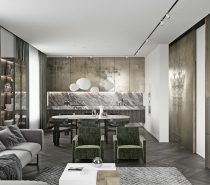 Throwing down a rug or two can make a world of difference – not just to the look of the room, but to the literal feel of the space, and even the echoey acoustics. Hang a modern chandelier over the bathtub – or set your tub below a magnificent central fixture. 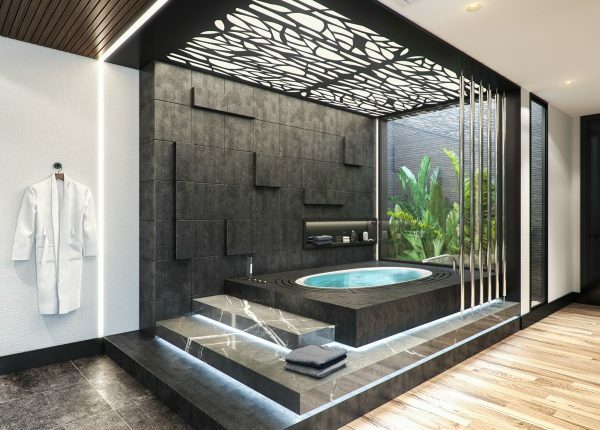 Love to spa together? 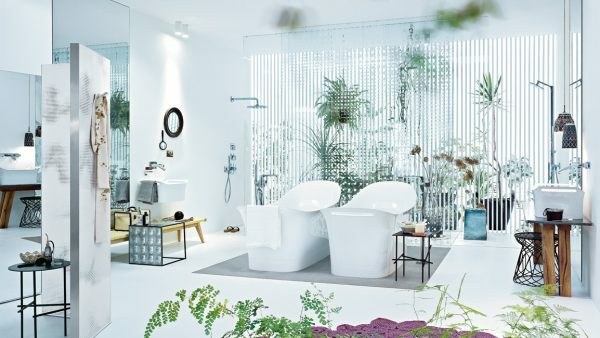 Why not recreate the couples spa experience at home with a double bathtub installation. 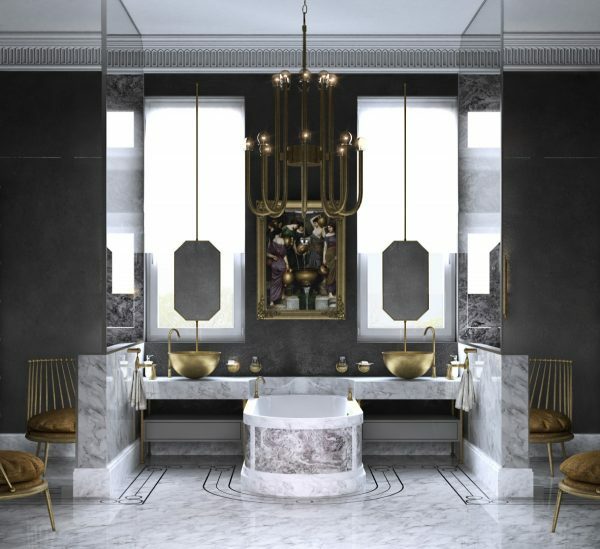 Build a neoclassical bathroom blend. 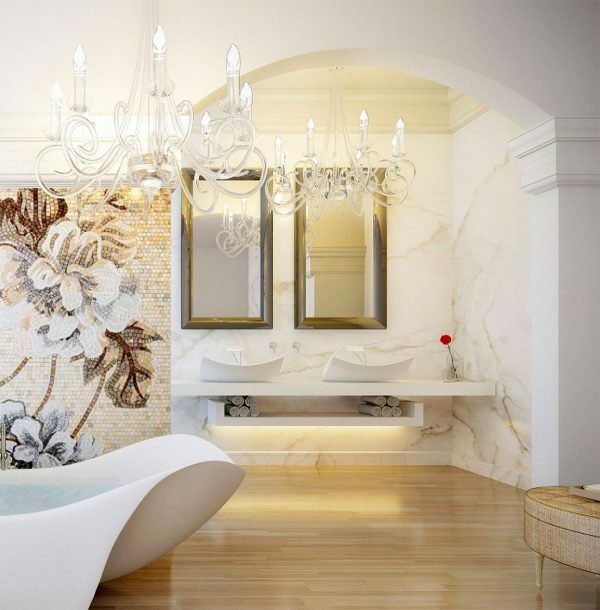 Incorporate modern bathroom furniture designs with classical touches, like elegant chandeliers and mosaic masterpieces. Don’t forget to add beautiful ceiling coving, corbels and wainscot. 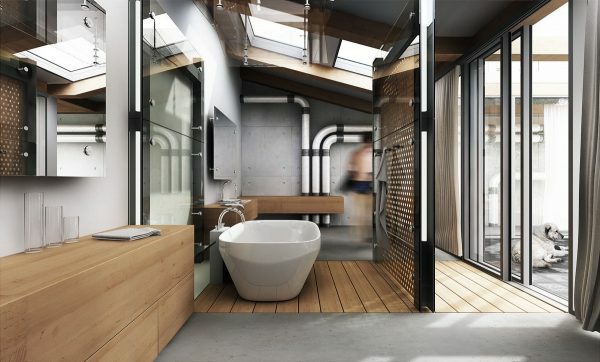 Fashion an eclectic modern bathroom. Pull together a collection of statement pieces that are each beautiful in their own right, even if they’re not necessarily ‘matching’. Use the intermittent decor to pull the elements together – like this colourful rug that echoes one circular coral table, and the stripes of an accent chair. Cram in a faux courtyard. 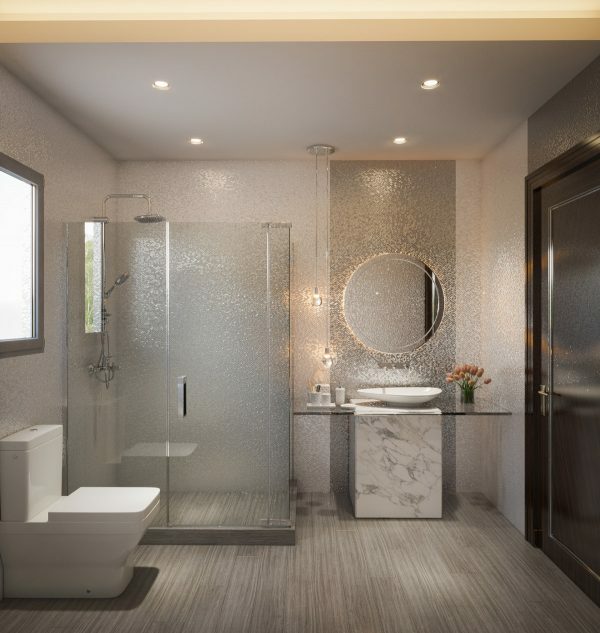 Does your master bathroom design have standing room only? 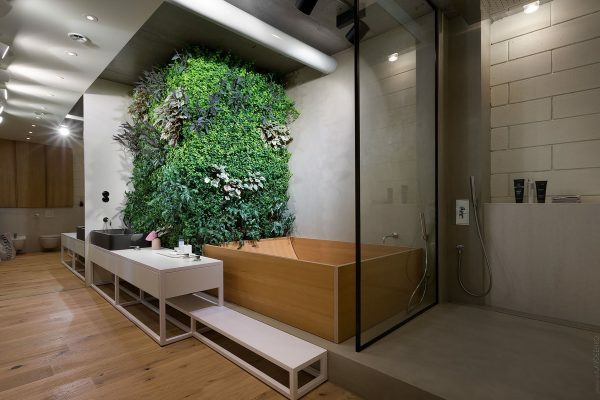 Not to worry, the plants can share the shower cubicle with you. Voila! A glass courtyard. Don’t have the budget, time or inclination to box in all that pipework or ducting? 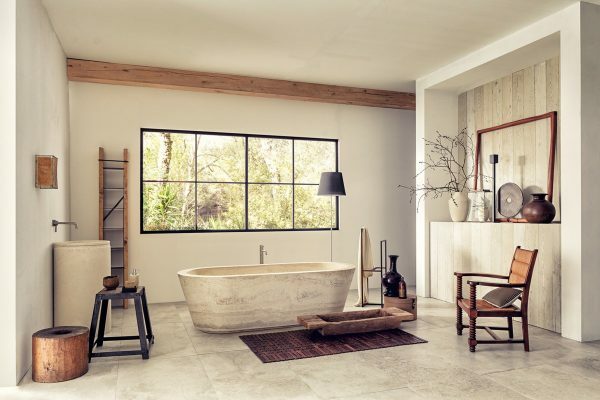 Go for an industrial bathroom style and let it all hang out instead. 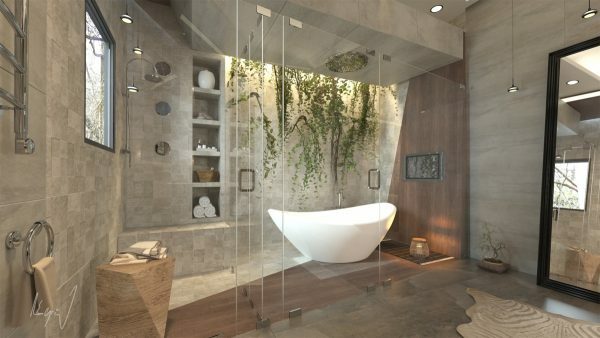 Another master bathroom with walk in closet. This time there’s a tub too. One statement piece can change everything. 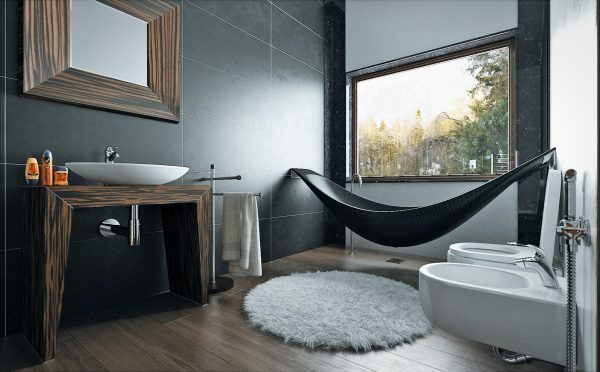 The room would still look smart without a hammock bath, but not nearly so impressive. 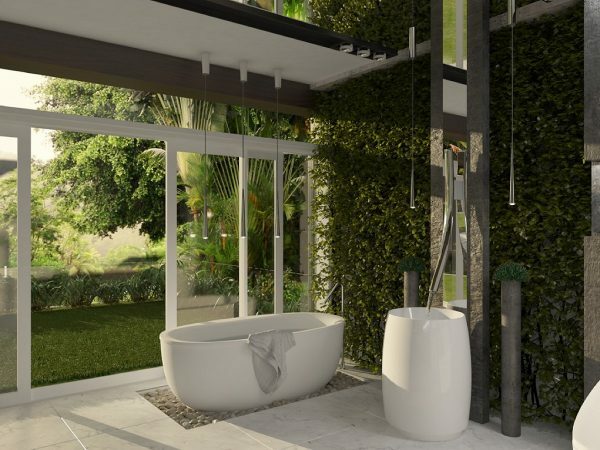 A combined wet area doesn’t have to mean an over shower bath. 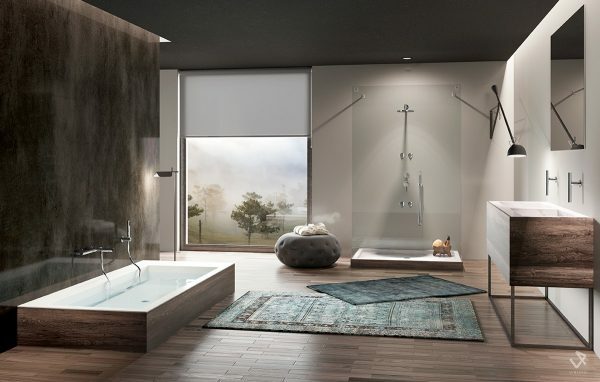 Many designs now put the bath and a separate shower unit side by side behind a single splash screen, or up on a platform together to make plumbing and drainage simpler. 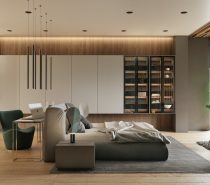 Fill up on feature walls. Sometimes bathroom wall decor can take a back seat to the main and essential working parts. 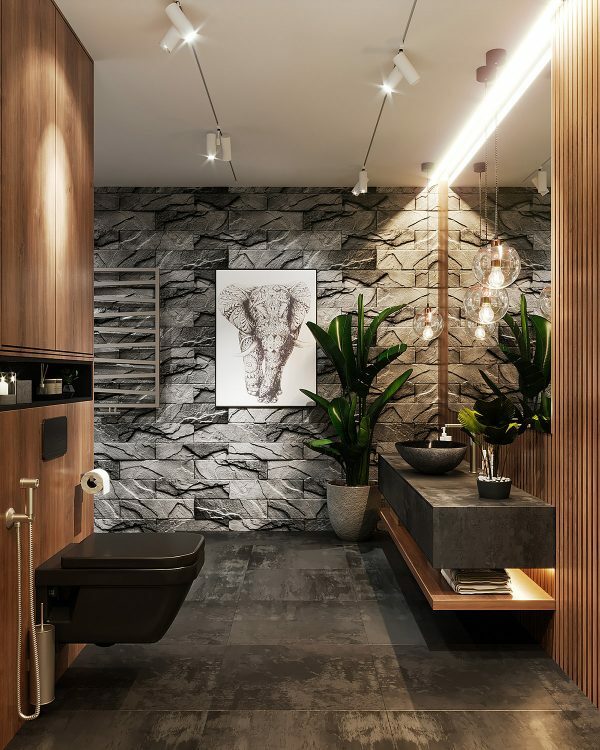 However, accent walls and wall art make a bathroom feel part of the rest of the house. 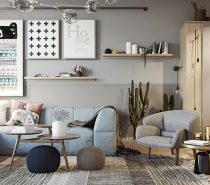 Look at ways in which to incorporate warm wood panelling, stone or brick effect feature walls, and eye-catching prints. Include substantial storage solutions. 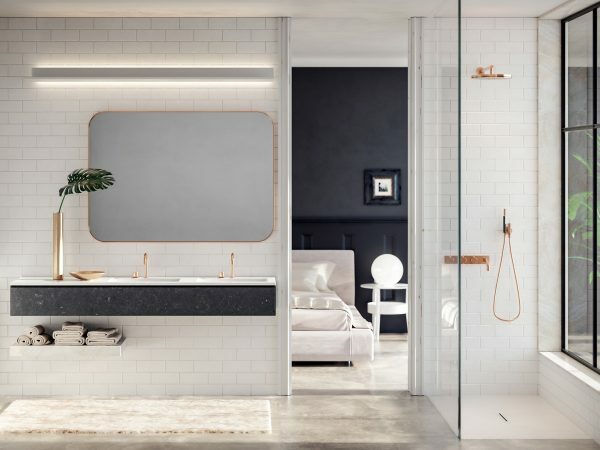 Bathrooms aren’t always big on cupboard space, but when it comes to bringing in all those fluffy folded towels, you’re going to wish you had somewhere roomy to stash them all. Section off the toilet in a larger sized room. 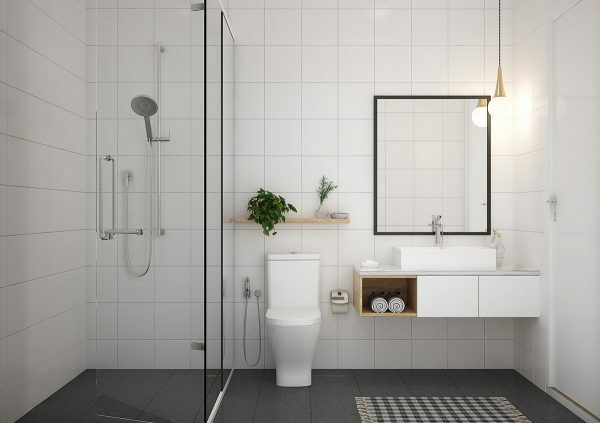 If you have the space to install a small room within a room then you might like to make the toilet completely private, but a partial partition wall can work well too. 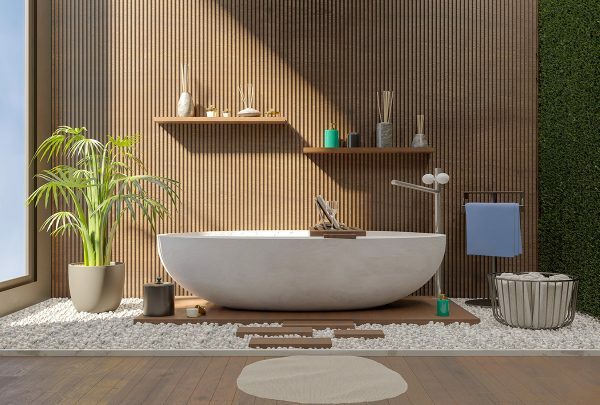 If you only invest in one special piece for your bathroom, consider a designer accent chair. 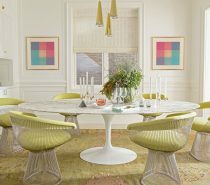 Since accent chairs can be be repurposed just about anywhere in the home, you can really get your money’s worth – even after the next bathroom makeover. 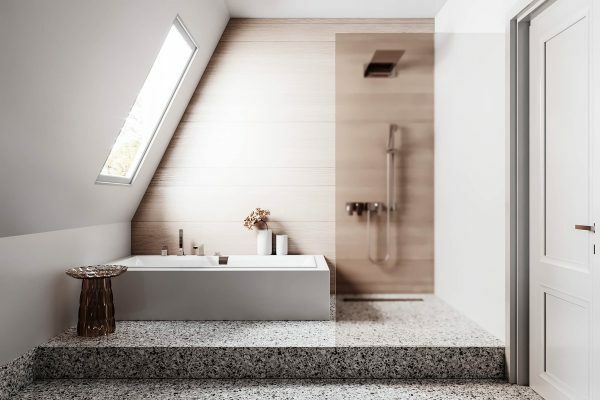 Side tables update a bathroom without making a permanent change. 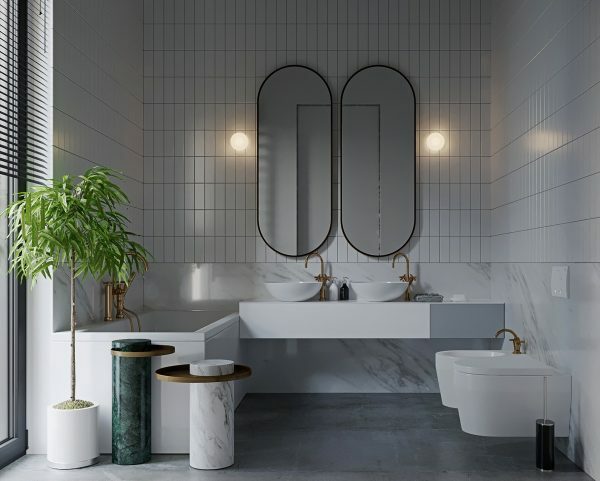 A set of white marble and jade green side tables accessorise this modern grey and white bathroom scheme. Follow the golden trend. 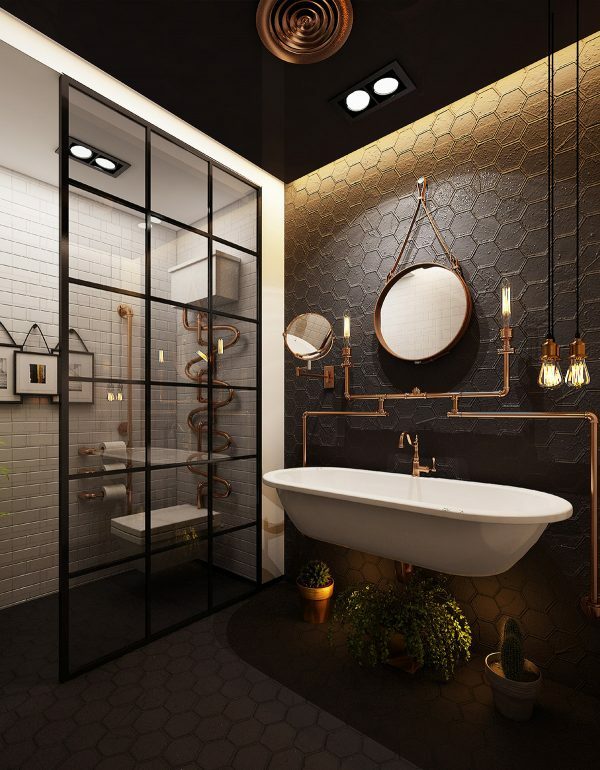 Gold and rose gold accents are the perfect way to add luxe to a modern bathroom look. Accessorise, accessorise, accessorise. 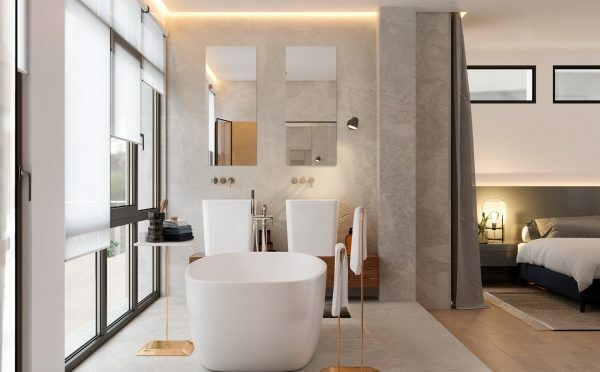 Shiny bathroom pendant lighting, collections of decorative vases, multiple reed diffusers, a designer toilet seat, and colour coordinated fresh towels – this master bathroom has it all going on. Let beautiful vessel sinks stand tall. 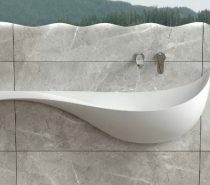 Tall vessel basins look stunning set atop a low linear vanity unit. Stairway to bathing heaven. 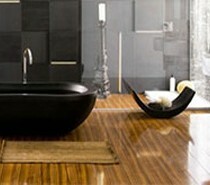 Make a production out of taking a bath, with a theatrical staircase lit and levelled with the side of the tub. 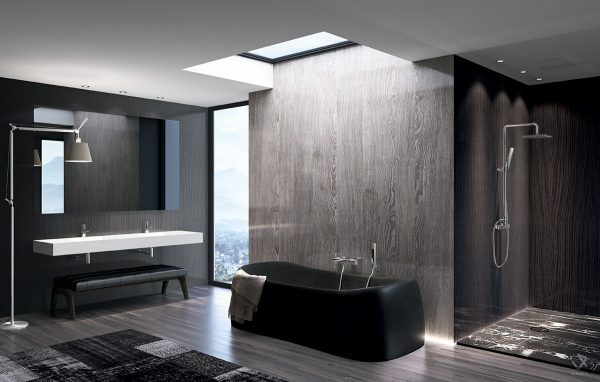 Large format bathroom tiles will make a room look more spacious. 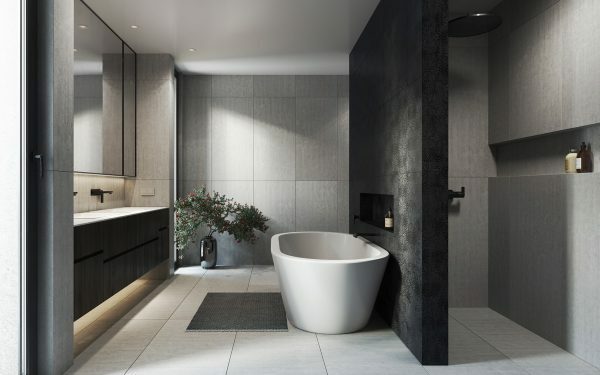 Punctuate an all white bathroom scheme with dark accessories. Looking for something different in vanity lighting? 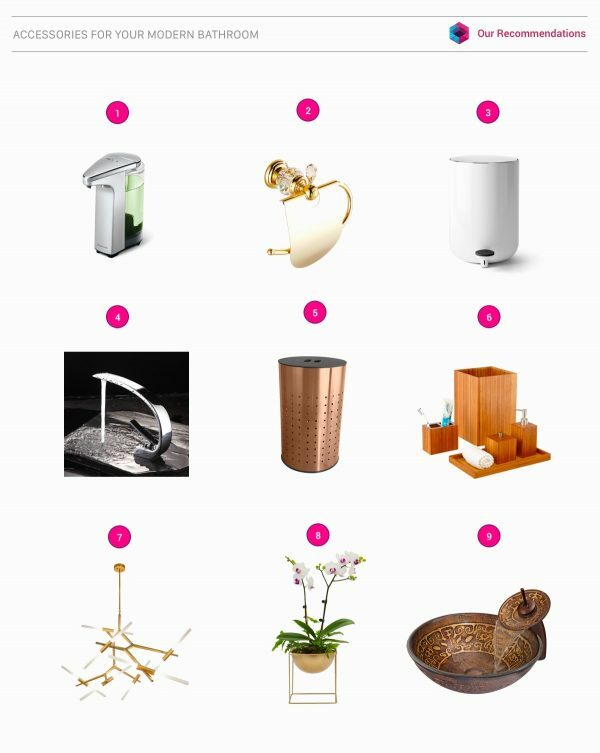 How about a bathroom floor lamp? 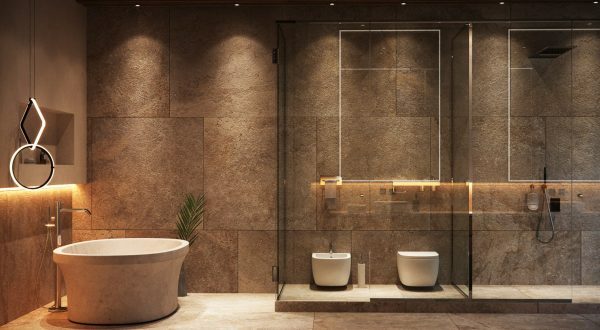 A bathroom floor lamp would provide great reading light whilst soaking in the tub too. …. or how about a classic scissor lamp? Reflect on natural light. Bathing your face in the morning sun, as well as at the basin, feels uplifting. But where do we put the vanity mirror when positioning bathroom sinks in front of windows? Have the best of both worlds by installing a ceiling mounted or stem affixed design. Make art out of pipework. 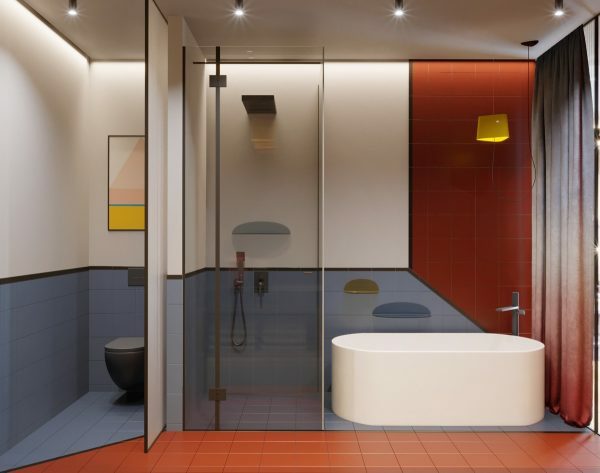 Be inspired by the greats, like the owners of this Mondrian style bathroom. 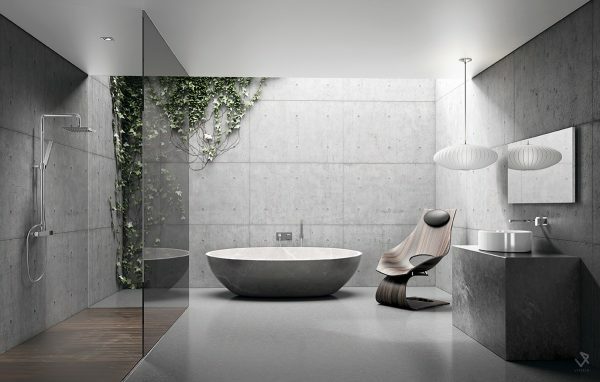 Keep it simple and serene with a minimalist scheme. 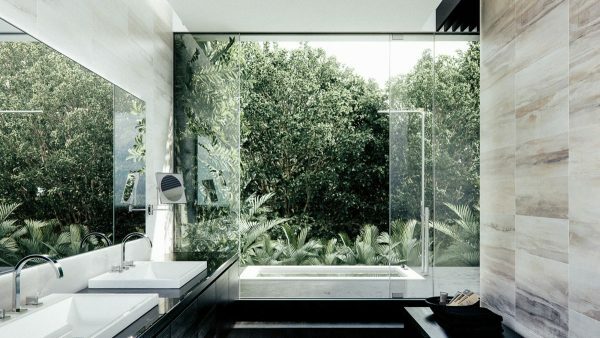 This minimalist bathroom shows how great design is achievable on a smaller scale and budget. Divide and conquer. 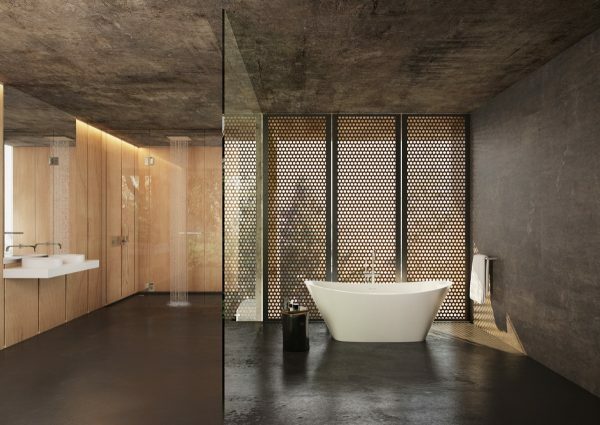 Build a dividing wall to section off a large shower enclosure, then use the new wall space to position a beautiful bathtub in pride of place. This dividing wall is positioned directly down the centre of the room so that the toilet and bidet can also be set behind it. 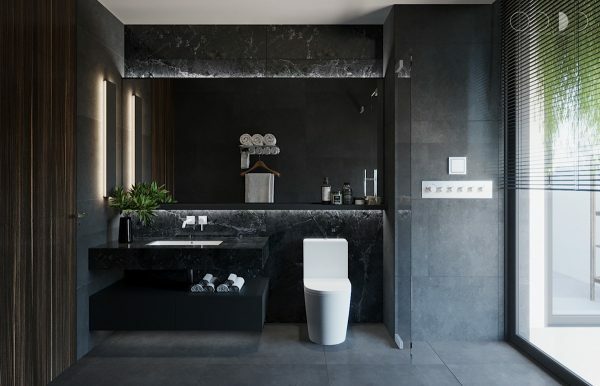 Black bathroom decor sets a moody scene, like a cool nightclub. 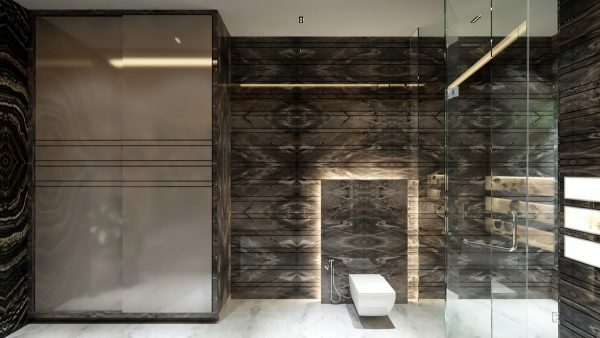 Create high contrast with black and white wall tiles, like this stunning white marble and black herringbone design. Turn up the texture with a wood ribbed feature wall. Create a warm runner of wooden floor panels. 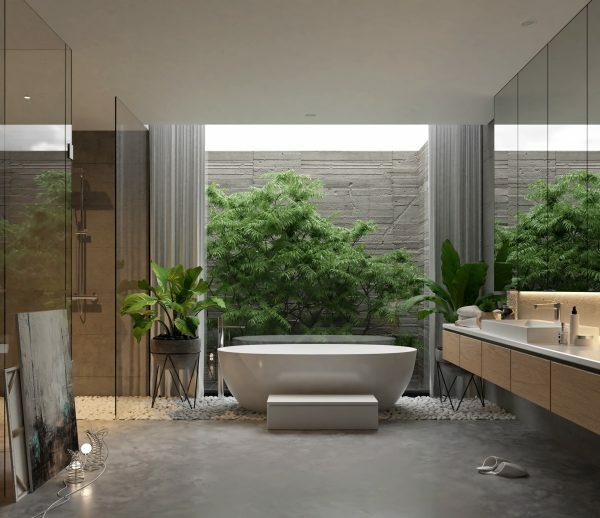 … Bring garden elements inside the room to make it a completely natural transition; use indoor plants, stone elements, wood grain features and pebble flooring. Install wall to wall sliding doors and let the breeze blow through.